Do you love the pumpkin flavors of fall? 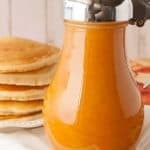 Drizzle this pumpkin pie syrup on pancakes, waffles or french toast! You’ll love it! Makes approximately 2 cups of syrup. Over medium high heat, bring the sugar, corn syrup and water to a boil. Boil for 3 minutes and remove from the heat. Whisk in the pumpkin puree and pumpkin pie spice until smooth. Serve over pancakes, waffles, or french toast. Store leftover syrup in the fridge.